Children learning history these days probably do not get much in the way of this event or how the world was changed as a result; but its significance cannot be overstated. 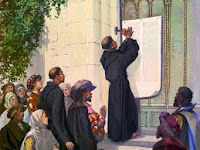 Allegedly, Luther merely wanted a scholarly discussion of some of the church's practices of the time. However, questioning was apparently tantamount to challenging—much as it is today. (Consider the current focus of worship or the movie, "The Shack." A simple question about either can bring a torrent of anger from people with little else other than an opinion.) As a result, Luther's divestiture and excommunication ignited a flame in Europe that spread the fire of revolution worldwide. The most significant aspect of that revolution was a renewed emphasis on the primacy of the Scriptures in the life of the believing church. With the invention of the printing press 75 years earlier the availability of printed copies of the Bible became common and anyone who could read now had access to this life-changing document. This fact alone contributed to the spread of revival fire throughout the world. Sola Scriptura—the "scriptures alone" govern church practice and interpretation. Sola Fide—"faith alone" is necessary to salvation, not good works. Sola Gratia—"grace alone" specifically excludes any merit earned by the person. These three, much more fully developed in history, established the foundational traditions of the Protestant Reformation. The Charismatic Movement came along some 450 years later in the mid- to late-60s with an emphasis on "thawing out" God's 'frozen chosen.' At first, this movement was characterized by a renewed interest in strong biblical teaching. However, the need to experience the 'move of the Spirit' began to take precedence in the lives of believers. Having an experience became the Holy Grail of the modern seeker. For many, that "experience" was something they seemed to need in order to validate their standing with God. Jesus sarcastically said, "Verily, verily, I say unto you, You seek me, not because you saw the miracles, but because you did eat of the loaves, and were filled." (John 6:26) It is not enough then or now to witness miracles performed on or for others. There must be a miracle for "me." He also chided Thomas with "Thomas, because you have seen me, you have believed: blessed are they that have not seen, and yet have believed." (John 20:29) Thomas begged for an 'experience' of Jesus, and he got it. Now he is forever known as "Doubting Thomas." I recently witnessed a young pastor's wife crying out with more sincerity and purity of heart than I can describe, "I just want to see oil dripping from my fingers." She is wanting an experience that she thinks is of the Lord, because there have been reports of others having this same experience. Is it possible for her—with her sincerity and purity of heart—to be deceived? The "Three Solas" have now been relegated to the position of an afterthought as "sola experientia" takes precedence in the lives of believers. It is so powerful now that even reason is governed by experience. Arguments in favor of the two things mentioned before—"The Shack" and weakened forms of worship—are only bolstered by "I think" and "I feel." I have yet to see an argument in favor of either made from a passage of scripture. Appeals made to the authority of God's Word by those who question such things are shot down with someone's experience. This is even happening from the pulpit of evangelical churches, the place where the Bible held sway for centuries. The push for experience has become so strong that the Scriptures have been pushed aside as people seek for, and are promised by some, an encounter or a breakthrough. However, the Scriptures can provide more "breakthrough" than any $59 seminar, which fills the coffers of the California clan and gives a breakthrough into things questionable. Instead of seeking after an experience, why not seek that which is true and can provide more lasting experience than any event? There is more than enough "felt experience" to be had just within the pages of your bible.